Have you ever been inside a nut-house? No one stirs there, not even a mouse. But I could be very wrong. You might see Batman in a thong. Or maybe the Joker in a very pink blouse! Honk-Honk! 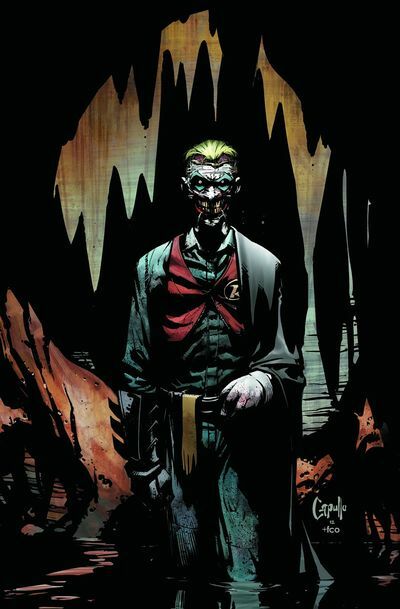 Well, according to the loopy creative team of Writer: Scott Snyder; Artists: Greg Capullo and Jock; plus Publisher: DC Comics in February 2013. Out of the following 6 scenarios, which 2 have ABSOLUTELY NOTHING to do with this STORY entitled, 'Castle Of Cards'? Whilst the Joker waltzes the dance of death through the vast hallways of Arkham Asylum -- by accident -- he wins first place in the reality television show, 'Dancing with the Stars'. Batman still want's to get his hands on him though. And forces himself to battle his way through many-many possessed-armed-guards -- including a couple of rascally-rogues -- to reaching the 'Harlequin of Hates' inner most sanctum far-far within this decapitated place of care. ... as well as that his 'Bat-Family' are up sh*t creek without a paddle. Ouch! That sound's pretty bad, doesn't it? But worst of all, these revelations results in the Riddler, the Penguin, and Two-Face, to stand by the Jokers side, when this pale-faced c*nt gives the Dark Knight a very shocking experience indeed. Meanwhile, in the back-up feature, Batman's nemeses argue amongst themselves. 'I don't need to throw a damn thing. The police will be here any minute. Until then, I'm just going to stand around and enjoy the view'. Well, it's not something you'd think Bruce would utter at a time like this, huh? It's as though his words are meant to taunt the Joker to 'show his hand' -- so to speak -- which was most probably his intention. Class comment. And would have been great if that's the way it actually played out. By far the best aspect about this adventure was its very shocking conclusion. Is Batman dead? Nah! Probably not. As elaborated in the back-up feature. But that is not to say that this forced predicament wasn't a blast to gasp at. Also, I did like seeing Batman on a horse too. It was very reminiscent to what he did in 'The Dark Knight Returns' graphic novel / cartoon. My one slight gripe about this tale is how the majority of it was rather 'one note' in nature. Basically, this installment illustrates how Batman is goaded to face the Joker in Arkham Asylum, only for this pale-face sod to give him a slap in turn. Nah! Too confined as a narrative. It was still nice though. I was very surprised at that baroque scene where the Joker forced a couple of characters to dress up as the Justice League, and then pop them off one by one. Not only did it add a level of tension to this part of the tale, but Greg Capullo did illustrate it in a very animated and bold style indeed. 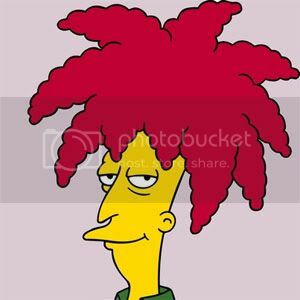 SIDESHOW BOB as THE JOKER: OK, I have to admit, one is yellow and has red hair, whilst the other is white and has green. Nonetheless, they're both nuts, right? CHIEF WIGGUM as THE PENGUIN: Come on. Don't tell me this thought has never crossed your mind! Whilst Batman was walking through the dingy hallways of Arkham, I couldn't help but hum an appropriate tune that I felt was very catchy and bold. The Monster Mash by Bobby "Boris" Pickett. OK, so what have we got here then? Batman shocked to the system. The rouges gallery in disarray. The Bat-family captured. And the Joker standing triumphant. No. It's not going to last, is it? For a start, the whole 'Alfred situation' needs to be resolved. Plus I'm pretty sure that at least one member of the Bat-Clan can turn this all around! But who? Huh? The prodigal son, Nightwing perhaps? The independent aide, Red-Robin? Bat-Wing? Batgirl? The brat? Or someone else entirely? What are your thoughts, dear reader? Personally speaking, I hope that either Batman or Alfred Pennyworth can kick the cack out of the aforementioned skinless wonder in the nick of time. Furthermore, depending on the breaks, let's hope they actually get their hands on this vile villain this time round; and not let him slip away as he has done so in the past. GIVE IT, IT'S DUES: Nice one Scott, Gregg, and Jock. This issue was far-far better than average.